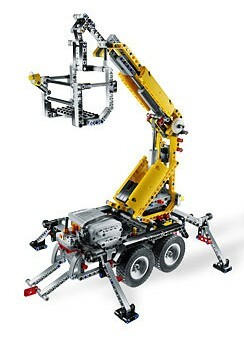 TBs: The Crane Truck can be a very complex and intricate model. 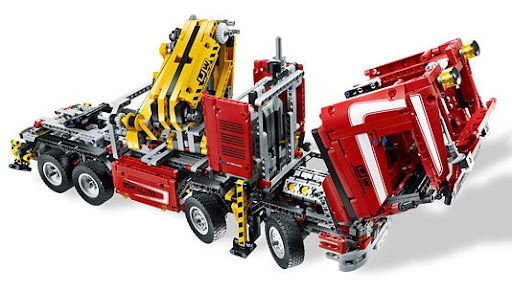 Which was the most challenging aspect to design on 8258 and that makes you most proud of? Uwe: Making all the different gears work, was probably the most challenging thing in the 8258 Crane Truck. Also the function of the crane arm took some time to develop. TBs: You are probably aware of the fans’ reactions and praises (like it beating the venerable 8480 Space Shuttle’s record number of gears and its nice look). But also some criticisms to the Crane Truck (like the outriggers’ flimsiness and the half tooth misalignment between the steering axles). Can you comment about eventual compromises you may have faced to design this model? Uwe: When designing a LEGO Technic model there is always compromises that have to be made, both regarding functions, size, time and price. Regarding the number of gears; it’s not a goal in itself to beat the records of previous models, we simply use the number of gears needed for that model. TBs: One idea you applied on the Crane Truck was to use Transmission Driving Rings to pass two motions through a turntable. This has been done several times in the past in fans’ creations, but this is the first time on an official LEGO set. Were you somehow inspired by other fans’ works? Uwe: The designer has built with this for many years in concept models, but those models have never been launch. This was the first time we needed it in a model that was launched. We do of course keep an eye on if somebody else comes up with brilliant ways of using the LEGO elements, but in this case it’s a very well known way of building for us. TBs: If you had the option to choose to do this model with such detailed functions, in a different time with pneumatic cylinders in the crane, what would you personally have preferred to use, the Linear Actuators or the Pneumatic parts instead? Uwe: For this model; clearly the Actuators because they are easier to control and have a longer reach. The pneumatic parts work better for models that have a limited space or functions that doesn’t need very fine control. TBs: After having designed this year’s Truck, is the Enzo Ferrari (8653) still your most challenging creation? Why? Uwe: No; the 8258 Crane Truck is definitely now my most challenging creation, because of all the different functions in the truck. TBs: How do you start designing a new set? Is it a trial and error process or following a very well-thought plan, using pre-existing modules and mechanisms? Do you use any design software to assist you in the design process? Uwe: We start by having an idea of what to build; from there it’s more or less a trial and error process. We don’t use any design software in the model design process. TBs: Which is your preferred TECHNIC part? Why? Uwe: It’s the: 32054 friction snap with cross hole, because it’s very easy to build a function as a module and then snap it on using this element. TBs: Which is your favorite LEGO TECHNIC set, ever? Why? Which old TECHNIC set would you most wish to have designed? Uwe: Clearly the 8258 Crane Truck, but I also think the 8285 Tow Truck is very nice. TBs: If you had the option to choose an old TECHNIC set to be re-released, considering all the required parts were still in production, which one would be your current choice? Uwe: That must be the 8880 Supercar. 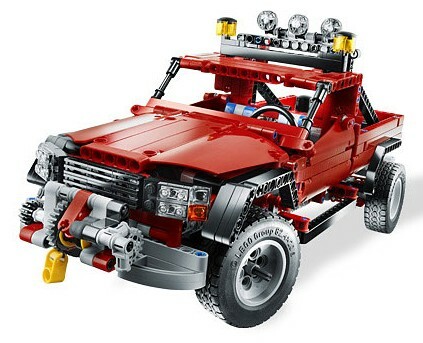 TBs: Does the Design team have the perception that at least part of the TECHNIC fans community is eagerly screaming for a large Exclusive TECHNIC set (like those existing for other themes), plenty of detail, functions and electrical parts? We have several sets reaching 400€ (or more) on other themes. Have you ever wished to design such a set? TBs: Do you and TLG follow what the online AFOL Community writes about TECHNIC, comments, suggestions, etc...? Uwe: Yes of course, we want to know what you like and don’t like about our models and elements. It’s always nice to get feedback and criticism. TBs: Thank you very much for your time Uwe, we wish you many great ideas for future sets. And thank you for the great Crane Truck! Please also leave a big thanks to Markus for another building machine, the excellent Front-Loader, which could perfectly have been another TECHNIC flagship model. Yay, 8880! That would definitely make both old-schoolers and newcomers alike happy. Since I don't have one I can't be sure, but for a remake I think the only discontinued parts, needing replacement with newer versions, are the wheels, steering arms and gear stick assembly. WOW 8880, Uwe is truly fan of supercars! This was a VERY nice surprise, thank you Conchas. "clearly the Actuators because they are easier to control and have a longer reach"
I'm not even gonna say it haha!